This year the principal from our local primary school bravely allowed me to paint a wall mural in the library. It is by far the largest painting I’ve ever done and I did feel quite terrified the day after I painted the first coat of blue on the wall and realised there was no going back. The school is small, with only three composite classes and the building housing the library is almost 100years old. The library room is a great space but was looking very tatty and uninspired. The school librarian led the way with her trademark clear vision, enthusiasm and amazing tenacity. The teachers and children then brainstormed for ideas and set to work transforming the library. Being part of a small community is wonderful and working with others who are passionate about their community is a real joy. 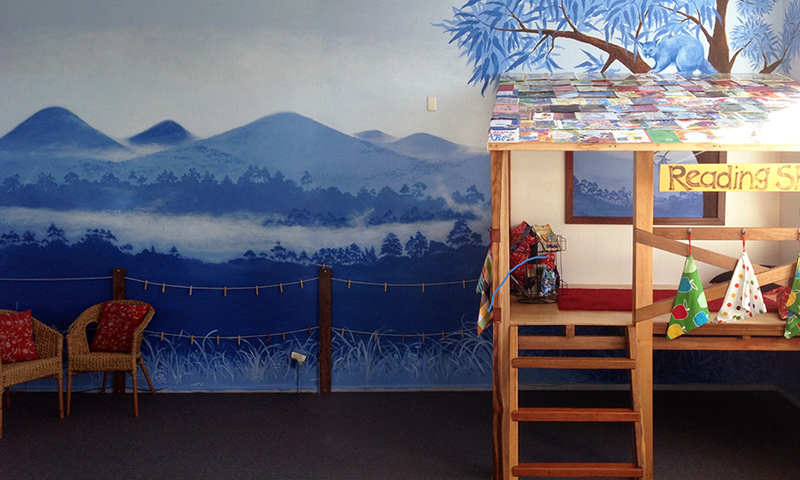 The kids now enjoy a beautiful space complete with a reading shack, comfy pillows and cozy reading corners. Wow, you really know how to bring a painting to life. Your paintings draw people in. Congrats! Hi Tarryn, how wonderful to hear from you. Glad you like it.